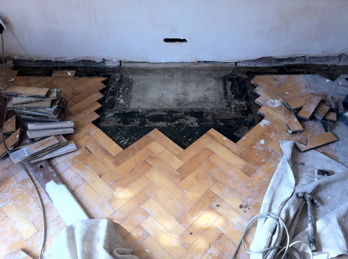 This photo set are pictures of parquet renovation projects in which we have undertaken block repairs and remedial works to the sub floor. All the pictures are direct 'before' and 'after' photos taken from basically the same vantage point in the room/area in which the particular project was taking place. 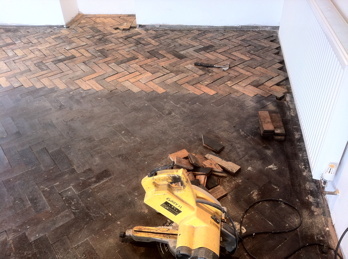 Parquet Block Repairs and Restoration Pictures / 7 'Rollover' pictures in this gallery. More images will be added soon. This project involved parquet block repairs to about 5m2 of this Hallway, our client supplied the blocks.The 'after' picture illustrates how good a repaired area can look if the works are done properly - quite a dramatic change here we think you'll agree. 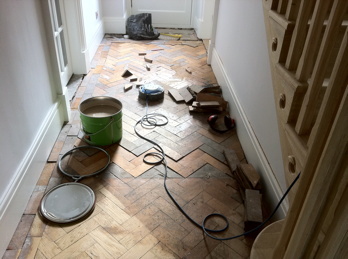 In this relatively small Hallway virtually all the parquet blocks apart from the border blocks were loose and needed fixing, when the remedial works, and then the Sanding and Sealing were completed the finished floor looked stunning. 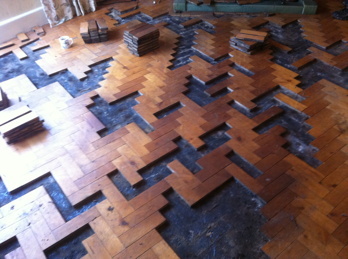 This was a fairly small project which required a major amount of work and detailed preparation, the client supplied the pitch pine parquet blocks which were slightly smaller than the existing original blocks, we had to gap fill the newly laid reclaimed blocks but fortunately the areas matched perfectly and looked magnificent. 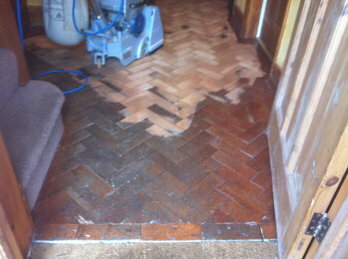 There were many loose parquet blocks which needed to be fixed back into position in this room, when the repair works were completed and the floor sanded and sealed the finished floor looked very good indeed and our clients were delighted. 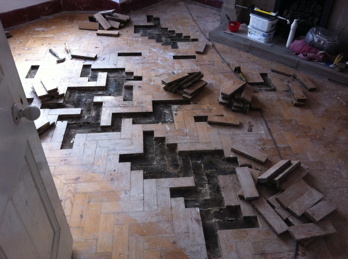 There were quite a few more oak parquet blocks to repair than had originally been envisaged, but we rose to the challenge and sorted out the many loose tiles, refixing them back into position then sanding off, gap filling and refinishing the floor to leave it looking almost unrecognizable from the floor of a few hours earlier. Our clients on this project wanted the voided fireplace area to be properly in filled with matching material, which was sourced from a local reclaimation yard, and was a perfect match to boot. 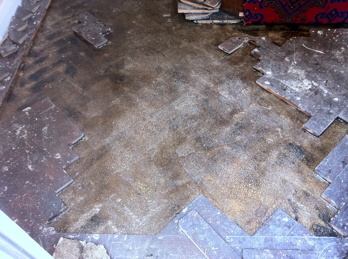 The finished repair and subsequent sand off and re-seal did look excellent and you could not tell where the repair had been done. Many of the blocks in this picture were loose and rattling about on our arrival, we re-fixed the loose blocks correctly back into their original positions, then sanded and sealed the Hallway, the Columbian Pine blocks looked superb when finished.